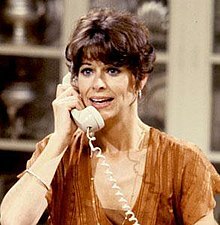 Caroline Margaret McWilliams (April 4, 1945 – February 11, 2010) was an American actress best known for her portrayal of Marcy Hill in the television series Benson. McWilliams had also appeared in nine episodes of its parent-series Soap, as Sally. She was a regular on the CBS soap Guiding Light (as Janet Norris) for several years and appeared in a short-term role (as Tracy DeWitt) on the NBC soap Another World. She also had a recurring role on Beverly Hills, 90210 playing the mother of Jamie Walters' character, Ray Pruit. McWilliams was born in Seattle and grew up in Rhode Island. She graduated in 1966 with a bachelor's degree from Carnegie Mellon University in Pittsburgh. She was married in 1982 to Michael Keaton, with whom she had a son, Sean, born in 1983. She and Keaton divorced in 1990. McWilliams's television appearances spanned every decade from the 1960s through the 2000s. She was a regular player on Guiding Light as Janet Mason Norris from 1969 until 1975. She portrayed a prostitute who helped an immigrant stay in the country by marrying him for money on Barney Miller in 1977. She was a semi-regular on Soap during the second season in 1978. She then appeared on Benson (as a different character) when that series premiered in 1979. She remained on Benson until 1981: the storyline stated that her character was departing to move away with her husband (her fiancé-turned-husband on the show having been played by Ted Danson). After this, she made a number of appearances in television comedies and dramas, including Kojak, Quincy, M.E., The Incredible Hulk, Project U.F.O., Hill Street Blues, Night Court, St. Elsewhere, Cagney & Lacey, Sisters (two episodes), Home Improvement, Murphy Brown and Judging Amy (three episodes). In 1989 she portrayed the ghostly wife, Clair Pritchard, in the short-lived comedy series Nearly Departed. She also appeared in numerous made-for-television movies, including The Death of Ocean View Park (1979), Rage! (1980), The Gift of Life (1982), Cass Malloy (1982) and Sworn to Silence (1987). Caroline McWilliams died from multiple myeloma at her home in Los Angeles, California on February 11, 2010, aged 64. ^ Obituary Los Angeles Times, February 22, 2010. ^ "Caroline McWilliams Obituary – Los Angeles, CA – Los Angeles Times". Los Angeles Times. Retrieved 19 September 2015. This page was last edited on 17 March 2019, at 21:04 (UTC).